Warhol-Signed Soup Can: Art or Memento? A Campbell's Soup can scribbled on by Andy Warhol surfaces three decades after it was hidden away in a coat closet. Must be worth a bundle, right? A reporter takes a journey through the art world to find out. Warhol-Signed Soup Can: Art or Memento? Andy Warhol signed this soup can at a Washington party in the 1970s. In a 1971 photo taken in London, Andy Warhol stands next to actress Jane Forth, star of his film Trash. One of his famous Campbell's Soup paintings is in the background. 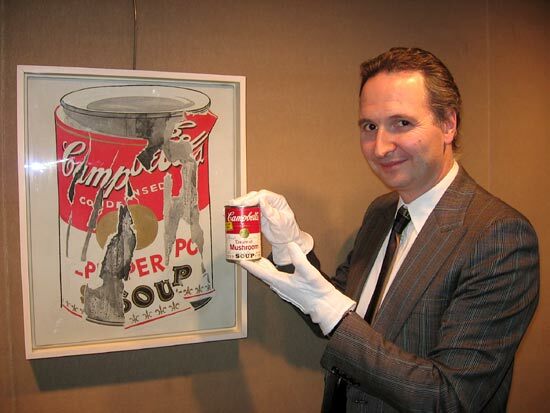 Christie's Deputy Chairman Brett Gorvy holds Eisele's autographed soup can next to a Warhol's "Small Torn Campbell's Soup Can (Pepper Pot)," 1962. The auction house puts the painting's value at $10 million to $15 million. The can is worth a lot less. In 1985, NPR's Andy Lyman covered an auction of a Warhol soup can painting and interviewed the artist. 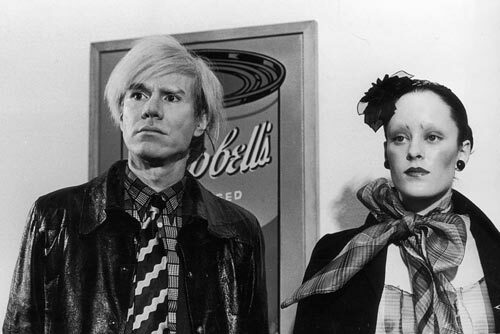 Hear what Warhol had to say about his infatuation with the iconic brand. 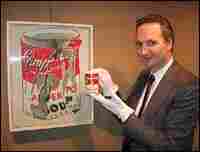 Vancouver artist Daniel Laskarin, also had a soup can that was signed by Warhol. But it had exploded in Laskarin's studio. It's now preserved in a Plexiglas container. 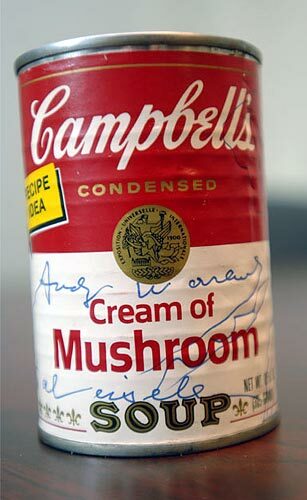 A Campbell's Soup can scribbled on by Andy Warhol surfaces three decades after it was hidden away in a coat closet. Must be worth a bundle, right? NPR's Kitty Eisele takes a journey through the art world to find out. When I set out to determine what our family "Warhol" was worth, friends and colleagues took guesses. "No, more like $12,000 to $14,000," another said. "I'm guessing higher," said a third. "I vote for $250,000." Nearly 30 years ago, my parents were at a party for several contemporary artists, and Andy Warhol was among the guests. My dad thought it would be fun to get his autograph on a soup can. So he asked his hosts whether they had any Campbell's soup. They did — and one signature and several doodles later, we had one of those things "that will be worth something someday." Decades later, the day had come and my dad wondered whether he should sell the can on eBay. I thought we should do a little more investigating, so I started calling a few museums. I learned there is an entire vocabulary you're supposed to know if you have a piece of art: what major collections it's been in and its "provenance" and appearances in "catalogues raisonnes." Our soup can hadn't been in any major collections or catalogues — it had been in a coat closet for three decades. And as to proof that Andy Warhol actually signed it — I was sure I could find people from that party — but really, who would keep a can of soup that long if Warhol hadn't signed it? I found a few references to Warhol-signed soup cans on the Web — including a blurry photo of a label peeled from a can, with smudged initials, going for a few thousand dollars. Ours was more intense — dedicated to my dad and sketched on with drawings that looked like hot dogs or lips. And it was still full of soup. So I thought I might have more to go on. I reached Daniel Laskarin, an artist in Vancouver, British Columbia, whose Web site mentioned he had a soup can signed by Warhol. But it had exploded in his studio. Laskarin explained that he'd gotten the can in a trade several years before and one day, he noticed it starting to tilt. He suspected the tomato broth had started to eat through the seam of the can — and within a day or so — the can's contents erupted. 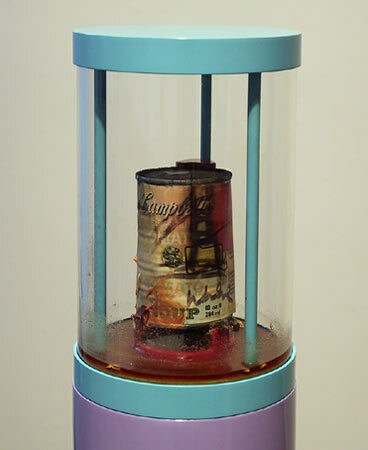 Laskarin decided to encase the piece in a Plexiglas container and name it in honor of Warhol's "death and disaster series." At that point I thought I needed to talk to a conservator or art expert or someone who could tell me how to preserve what we had. That turned out to be Campbell's. Their very nice "Director of Toxicology" George Dunaif told me Campbell's doesn't keep soup past two years, so he couldn't say what might happen. But under normal conditions, save bumps or extreme temperatures, he didn't think the soup was volatile and should be stable enough to keep the can around the house. 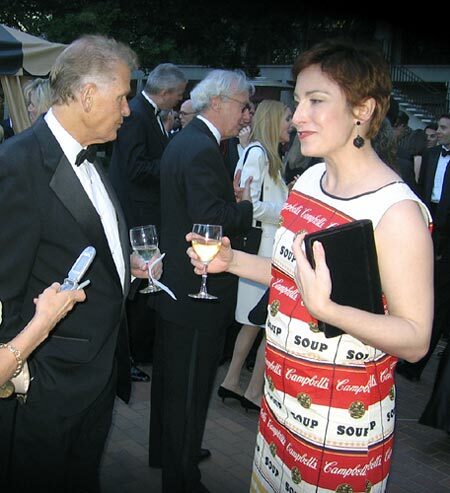 Thomas Sokolowski of the Andy Warhol Museum in Pittsburgh told me that Warhol sometimes signed soup cans at gallery events as a sort of stunt, but mine sounded a little different. Sokolowski also said that actor Dennis Hopper was one of the very first people to buy a Warhol painting of soup. What good is working for public radio if you don't use an excuse like this to interview Dennis Hopper? He was, and remains, an artist, well-regarded and currently exhibiting work in Los Angeles. Back in the early '60s, Hopper recalled, he'd gotten to know art dealer Irving Blum, who first showed him photos of Warhol's work. Hopper later bought one of the very first soup can paintings when Blum showed them on the West Coast. Hopper vividly remembers how excited he felt seeing Warhol's work. "This was the 'return to reality' everyone was talking about, at the end of a period of abstract expressionism. It was amazing — it was terrific." Christie's, it turned out, was selling a major Warhol work in May — one of the very first, and they believed, very best soup can paintings. The work is from Blum, the man who had first championed Warhol and who had introduced him to Hopper. It's a gorgeous painting — of a can of Pepper Pot soup with its label shredded, in brilliant colors of red, gold and charcoal. They were estimating it would sell for $10 million to $15 million. There is nothing like walking into a major auction house with a small paper bag containing a can of soup, and wondering if you're in the right place. Brett Gorvy, Christie's contemporary art curator and the company's deputy chairman, met me in a hushed skybox room overlooking the auction floor. He offered to get the painting and returned moments later to hang it on the wall. There really was no comparison. One was clearly a stupendous painting; the other was a charming piece of "memorabilia." Despite the doodles on the can (Hopper had said he thought they were hot dogs, a reference to Claes Oldenburg's soft sculptures of food), Christie's told me what I had was basically an autograph — "cool, in fact" because it was on the soup can, but not an actual work of art. 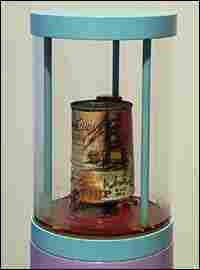 The difference, Gorvy explained, was that the artist would have had to demonstrate some intent to call it "art" — for example, if Warhol had plucked the can from the kitchen and put it on display. Warhol really didn't do things like that. Some other artists used found objects, but Warhol was really about painting and drawing them. So there is my tale — a soup can treasure, that, in fact, Gorvy was reluctant to appraise. "How can you put a price on something that's really a memory?" he said, so graceful in letting me down gently. He guessed it would fetch somewhere from a few hundred to a few thousand dollars, depending on the buyer. I certainly hadn't wanted to see the can sold, so I'm proposing an "extended loan" in which it will reside on my bookshelf as its own work of art. I'm thinking of taking bets on its eventual demise, and waiting for an art "happening" of my own. 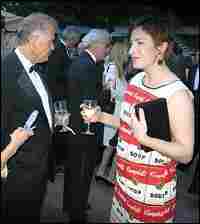 Kitty Eisele wears an "Andy Warhol Souper Dress" on a recent night out. The dress, made of paper, was issued by Campbell's in 1967. Consumers could get it in the mail for two soup labels and a dollar.